Typical Analysis: 14-0-2, 10% Humic acids, 10% Amino acids. Onyx organic bio-stimulant fertiliser is an organic source of nitrogen, potassium, trace elements and significant levels of amino acids. 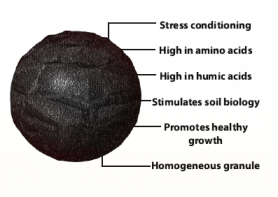 Onyx helps protect against stress and promotes recovery from harsh weather conditions and mowing, as well as the use of pesticides and fertiliser. Mini size granules make it ideal for greens and close-cut turf. Ideal for greens, lawns and any close cut turf. Ensures the highest coverage and uniformity. Effectively penetrates the sward. Suitable for grass cut above 6mm for controlled release.